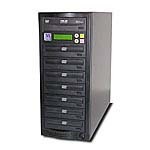 M-Tech are pioneers in CD, DVD & Blu Ray duplication technology and have been established since 1995. The strength of the M-Tech brand can be partly measured by the customers that use them: Metropolitan Police, Glaxo SmithKline, 'Blur', and the cream of the worlds duplicating houses, to name a few. The secret behind M-Tech's success is simple, M-Tech only use components that are manufactured and designed with performance and reliability in mind. While you may well be able to purchase a tower duplicator from a built to order company, made on site with an uncertain mix of parts - the performance and durability cannot be compared. M-Tech towers use drives especially selected for this environment with firmware optimised for tower duplication. The technology behind multi drive duplication is far more involved than a single writer in a PC, therefore and drive selected for PC use will not be suitable for Tower duplicators. M-Tech towers all have an on board buffer memory expertly matched to the size of duplicator. This is extremely important to ensure reliable duplication. When dealing with up to 7 burning drives this increased buffer memory allows the controller to distribute the information from the master device safely between the writing drives. While burn proof technology can compensate for some interruptions or delays in receiving the master information, the buffer of most other towers is insufficient to allow reliable duplication over large production runs. Features of the M-Tech towers include 'Load & Go' technology, auto format recognition, the ability to ignore read errors on poor quality masters, selectable writing speed, optional internal hard drive for multiple image storage and much more. We find that the majority of our customers use the M-Tech towers for audio use. The developers of the M-Tech architecture have led the way with audio duplication. M-tech recognise and understand the sensitivity of audio data. Duplicators only designed for Data use will not be suitable for professional audio applications. If audio integrity is important to you - then M-Tech has to be the right choice for you, ensuring reliable, high integrity duplication every time. M-Tech are truly built to last, with a healthy mix of value, reliability and unbeatable performance whether you're making one copy or a thousand.